This was adorable and offers a wonderful learning experience for young children The illustrations are vibrant, the characters are fun, and I love the emphasis on learning a new language to visit the many countries that are out there. Well done. 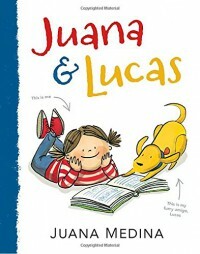 Fans of Judy Moody, will love this story of Juana and her dog learning English and traveling to America. It offers many opportunities for children to learn new vocabulary as well as a bit of Spanish language. The illustrations are sure to draw their attention to this lovely book. Will definitely be recommending this to families at the library. Its such a great readers advisory book. All ages are sure to love it.